King of Thieves 2.5 APK has been updated with better performance. The latest version has more features and also fixed some previous issues. After release on iOS-based mobile devices in February, now finally it is coming to Android devices. It has been provided through the Google Play Store. The game is described by ZeptoLabs as PvP game multiplayer gameplay elements mix of platformer and tower defense. Players can run and jump over obstacles to reach the enemy base and steal coins or treasures. 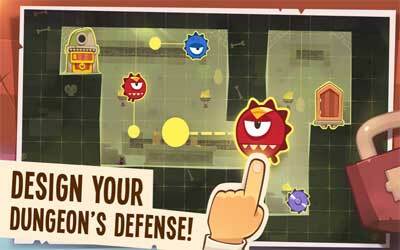 In addition, players also need to increase your own defense headquarters so difficult to penetrate the opponent. In addition, players can also customize the appearance of your character becomes more cool looks, test the ability yourselves pass 80 levels in single-player mode and create or establish a guild to build alliances with other players. Introducing King of Thieves, the new game from the makers of award-winning Cut the Rope, loved by millions of players worldwide! STEAL SHINY THINGS. Collect gold and gems from other players to become the wealthiest thief in the world! DEFEND YOUR LOOT. Design your dungeons and watch other thieves getting into your traps. Muhaha! CLAIM THE THRONE. Compete with other players worldwide, leaving your rivals on the bottom of leaderboards. GET CRAFTY. Create new outfits for your character. The most nifty thieves should look really cool! TRAVEL AND EXPLORE. Test your agility through 80 single-mode levels or dive into the underground world of user generated content. CREATE AND JOIN GUILDS. Find reliable allies to stand against hostile guilds of thieves! UNIQUE GEMS WITH SPECIAL ABILITIES. Nobody knows where these gems came from and what artifacts they hold inside. What is definitely known, though: the only way to obtain a unique gem is to win a challenge. CHALLENGES. Every weekend, thieves from all over the world gather to fight for unique gems in different thievery disciplines. Don’t miss it! GUILD NEWCOMERS. Players who join the guild during the Guild Battle will have to skip the current round. Their delta won’t add up until the next round. This game is an addicting mmo in which you set up traps to protect your treasure. You can even steal from other dungeons!